Shortcuts which are used on a windows computer? Which are commonly used shortcuts while using a windows computer? Re: Shortcuts which are used on a windows computer? There are many commonly used shortcuts for a windows computer. The shortcuts are used for specific purposes. Usually the shortcuts are combinations of two or more keys. Ctrl + C is used to copy data. By using this shortcut, you will be able to copy sentences, words, pictures and even number. Ctrl+ V is the shortcut for paste. Ctrl + X is the shortcut for Cutting. Ctrl + S are used for saving files. The shortcut Ctrl + P is used for printing documents and pictures. These are some of the commonly used shortcuts on a windows computer. for shutting down use "alt + F4" or "alt + s " or window key. F11 for full screen . n F5 for referesh . Esc for close the program. ctrl +s saving files, ctrl +o opening files, ctrl +n for new files, ctrl + c copy files, ctrl + v pasting , ctrl +x cutting, . etc. Alt + Tab X X X X X X X X Switch between open applications. Alt + Shift + Tab X X X X X X X X Switch backwards between open applications. Alt + double-click X X X X X X X Display the properties of the object you double-click on. For example, doing this on a file would display its properties. Ctrl + Tab X X X X X X X X Switches between program groups or document windows in applications that support this feature. Ctrl + Shift + Tab X X X X X X X X Same as above but backwards. X X X X X X X X Create a screen shot only for the program you are currently in. Ctrl + Alt + Del X X X X X X X X Reboot the computer and brings up the Windows task manager. Ctrl + Shift + Esc X X X X Immediately bring up the Windows task manager. Ctrl + Esc X X X X X X X X Bring up the Windows Start menu. In Windows 3.x this would bring up the Task Manager. Alt + Esc X X X X X X X Switch Between open applications on taskbar. F1 X X X X X X X X Activates help for current open application. F2 X X X X X X X X Renames selected Icon. F3 X X X X X X X Starts find from desktop. F4 X X X X X X X Opens the drive selection when browsing. F5 X X X X X X X Refresh Contents to where you were on the page. Ctrl + F5 X X Refreshes page to the beginning of the page. F10 X X X X X X X X Activates menu bar. Shift + F10 X X X X X X X Simulates right-click on selected item. F4 X X X X X X X Select a different location to browse in the Windows Explorer toolbar. Alt + F4 X X X X X X X X Closes Current open program. Ctrl + F4 X X X X X X X X Closes Window in Program. F6 X X X X X X X Move cursor to different Windows Explorer pane. Alt + Space bar X X X X X X X X Drops down the window control menu. Alt + Enter X X X X X X X Opens properties window of selected icon or program. Alt + Space bar X X X X X X X Open the control menu for the current window open. Shift + Del X X X X X X X Delete programs/files without throwing them into the recycle bin. Holding Shift X X X X X X X X Boot Safe Mode or by pass system files as the computer is booting. Holding Shift X X X X X X X When putting in an audio CD, will prevent CD Player from playing. Enter X X X X X X X X Activates the highlighted program. Alt + Down arrow X X X X X X X Display all available options on drop down menu. X X X X X X X Expands all folders on the currently selected folder or drive in Windows Explorer. + (on the keypad) X X X X X X X Expands only the currently selected folder in Windows Explorer. - (on the keypad) X X X X X X X Collapses the currently selected folder in Windows Explorer. Below is a listing of Windows keys that can be used on computers running a Microsoft Windows operating system and using a keyboard with a Windows key. In the below list of shortcuts, the Windows key is represented by "WINKEY". WINKEY Pressing the Windows key alone will open Start. WINKEY + L Lock the computer and switch users if needed (Windows XP and above only). There are allots of the short - cut keys are available in MS office software. There are many more shortcut keys. Shift+Right-Click on a file: Adds extra hidden items to the Send To menu . Shift+Right-Click on a folder: Adds Command Prompt Here, which lets you easily open a command prompt in that folder . for the fast and reliable work windows offers varies shortcuts to perform the desired tasks like for coping ctrl +C is used, for cut cyrl +X is used, for paste ctrl +v is used similarly for saving a document the ctrl +s is used , for selecting the whole text ctrl +A is used, for getting shut down menu alt + F4 is used,for task manager menu ctrl + alt + del. is used. windows key + L etc these are the some of the shortcuts to use in the windows OS. There are many Short Cuts used in Windows. Alt+Tab--> to look at the Opened Windows. Windows Key + D--> To Minimize the Window. 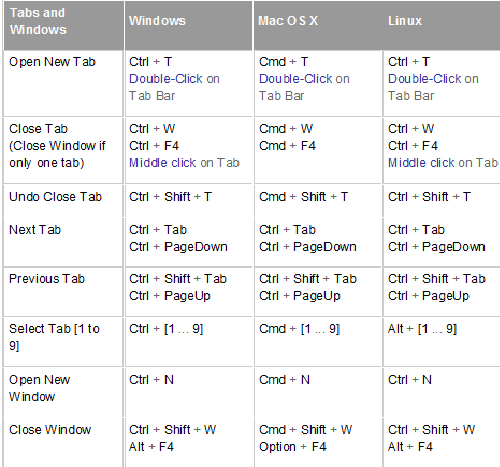 Windows Key + Tab--> To look at the Opened Windows in the Graphical Way. Shift+Del-> To delete the file Permanently. Windows Key+R--> Opens the Run. ALT+SPACEBAR Display the System menu. SHIFT+F10 Display the Help and Support shortcut menu. ALT+TAB Switch between the Help and Support Center and other open windows. CTRL+TAB Switch to the next pane. CTRL+SHIFT+TAB Switch to the previous pane. UP ARROW Move up one item in the Index, search results, or list of Help topics. DOWN ARROW Move down one item in the Index, search results, or list of Help topics. PAGE UP Move up one page in the Index, search results, or list of Help topics. PAGE DOWN Move down one page in the Index, search results, or list of Help topics. F6 Switch focus between the different panes in Help and Support Center. UP ARROW or DOWN ARROW Scroll through a topic. CTRL+HOME Move to the beginning of a topic. CTRL+END Move to the end of a topic. CTRL+A Select all text in a pane. ALT+LEFT ARROW Move back to the previously viewed topic. ALT+RIGHT ARROW Move forward to the next (previously viewed) topic. ALT+F4 Close Help and Support Center. There they are many shortcuts usually used for some computer of windows. The shortcuts are used for the specific purposes. Normally the shortcuts are combinations of two or more keys. CTRL + the c is accustomed to copy data. For using this take a short cut, will be capable of copy sentences, words, cinemas and even number. CTRL+ the v is the shortcut for the paste. CTRL + the x is the shortcut to stop. CTRL + the s is used to save files. The CTRL of shortcut + the p is used to print documents and cinemas. This one are one of the usually were accustomed shortcuts in some computer of windows. Change+Triumph+Ascendant fleche: Increase to the maximum the active window vertically. Triumph+Down it draws: Minimize the window/restores the window if it it interprets in the more wide sense. Triumph+Fleches of left/right side: Stuff the window to each side of the monitor. Change+Triumph+Fleches of left/right side: Move the window to the monitor to the left or makes straight . Alt+Rise: Go up a level of folder in the explorer of Windows. Alt+P: Elbow-shaped lever the sheet of glass of previous view in the Windows explorer. Change+Give a blow to the secondary key of the mouse on in a file: Add the copy as the road, that copies the road of a file to the briefcase. Switch backwards between open applications. Delete programs/files without transferring to the recycle bin. There are many shortcuts in Windows Computer. Esc Dismisses any dialog that has the Cancel button. Ctrl + P Calls the Print dialog. Shift + F3 Changes case (convert the word from lowercase to uppercase and vice versa). !Please Visit The Following Link For More Advanced Options! it's seems you are new for windows computer.........and hence it's my duty to guide to you about the shortcut keys which are generally used in windows computer. For better understanding purpose, I send you two links of videos, where both will tell you about shortcut keys nicely. Ctrl + P -- Calls the Print dialog. There are lots of Shortcuts in Windows, Shortcuts help us do our work directly, easily and comfortably. 1) Start button on keyboard will open start menu no matter what are you doing. 2) Ctrl-C will copy the selected. 3) Ctrl+V will paste the copied. 4) Ctrl+X will cut the selected. 5) Ctrl+S will save the wanted. 7) Ctrl-Z will undo last work. 8) Del/Delete will the delete the selected. 9) Ctrl+Esc will open Start menu. 10) Esc will exit current/minimize full-screen. 11) Pressing Shift key will turn on sticky key. There are much more shortcuts in Microsoft Windows, but the above are most used, basic and useful ones. There are common shortcuts for windows but i have given most surprising shortcuts. -->To get windows you need to press Start button in the keyboard. -->For copying anything you need press ctrl+c. -->For pasting purpose you need to click ctrl+v. -->For deleting purpose you need press ctrl+x. -->For playing songs you will have shortcut key in the keyboard like play symbol. -->If you are running more than one program then if you want jump into another window just press 'just hold alt and blink the tab'..
-->For the upper letters no need to caps lock should be on position you can hold shift and then press letter which you want..
-->If you want to see the properties of the file then press properties button which is their between alt and ctrl. There are so many shortcuts in windows computer. ALT+LEFTSHIFT+NUMLOCK TO ACTIVATING MOUSEKEYS(STICKY KEYS). USING ALL THESE ABOVE KEYS YOU CAN DONE ANYTHING WITH YOUR KEYBOARD. USING STICKY KEYS YOU CAN USE THE NUM KEYPARD AS YOUR MOUSE. These are the some of the shortcut keys used in your Windows computer. 3.Ctrl+W=Close a current window tab. 8.Page down=move a page down. 9.Page up=Move a page up. 11.Ctrl+B=To make selected text bold. These are the some shortcut keys used in windows computer. Hold Win + E -> My Computer. Hold Alt + Enter -> Properties of Selected File. Hold Win + D -> Show your Desktop. Hit RCL , M -> Rename Selected File. Hit RCL , P -> Play Video Files. Hold Shift + Del -> Permanently delete Files. Hold Alt + F4 -> Shut Down or Close opened Window. F11 for full screen . n F5 for refresh . Esc for close the program. Alt + F	>>File menu options in current program. F1	>>Universal Help in almost every Windows program. Ctrl + A	>>Select all text. Ctrl + X	>>Cut selected item. Shift + Del	>>Cut selected item. Ctrl + C	>>Copy selected item. Ctrl + P	>>Print the current page or document. Home >>Goes to beginning of current line. Ctrl + Home >>Goes to beginning of document. End	>>Goes to end of current line. Ctrl + End	>>Goes to end of document. Shift + Home >>Highlights from current position to beginning of line. Shift + End >>Highlights from current position to end of line. Ctrl + Left arrow >>Moves one word to the left at a time. Ctrl + Right arrow >>Moves one word to the right at a time. F1 >>Activates help for current open application. If you're at the Windows Desktop, this will activate the help for Windows. F2 >>Renames a highlighted icon, file, or folder in all versions of Windows. F3 >>Starts find or search when at the Windows Desktop in all versions of Windows. F4 >>In Windows 95 and later this opens the drive selection or address bar when browsing files in Windows Explorer. F6 >>While in Windows Explorer, this will move the cursor to different Windows Explorer pane or in Windows 7 browse available drives. F8 >>Pressing F8 over and over as the computer is booting will start the computer in Safe Mode. F10 >>Activates the File menu bar in all versions of Windows. There are so many short cuts that can be performed on windows computer in our regular operations. Ctrl + c : this shortcut will be used to copy the data. Before using the short cut key, that specific file should be selected. Ctrl + v. this shortcut generally we will use for pasting the data somewhere. Ctrl + X this short cut will be used to cut the data or file. like that there are number of short cuts. There are so many shortcuts that are available in windows computer.You can find all those short cuts in windows help by typing the keyboard shortcuts in the help search.